Recently our wedding was featured on NJ Bride Magazine’s website which was really cool I have to admit. Our photographer Jenifer Rutherford (who I seriously cannot recommend enough) took amazing photos that she submitted to the magazine. It was a pretty awesome surprise to see TB and I, and our drunk friends, on a magazines website. It also gave me a chance to look at those photos again and remember what fun it was and how much work! 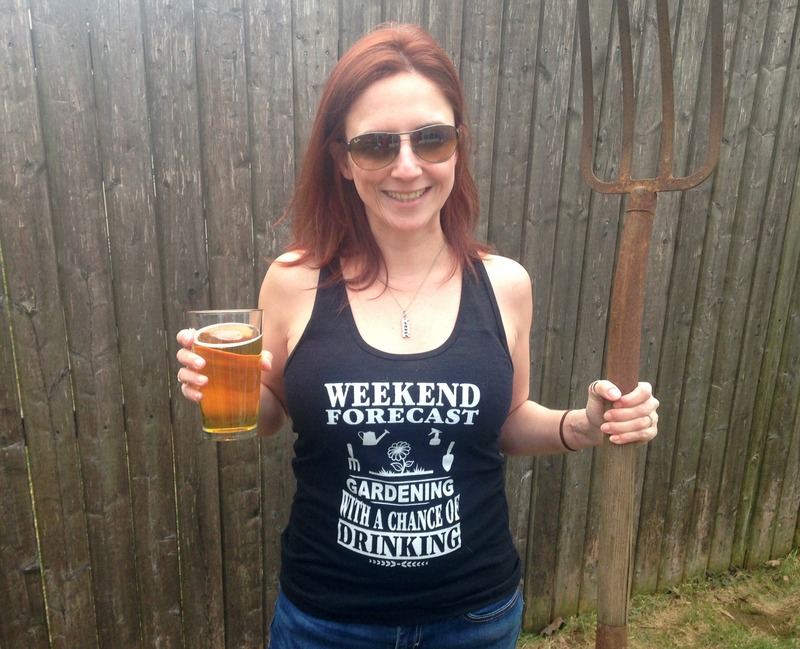 I made a lot for the wedding for two reasons: 1) it was cheaper and 2) it was the only way to get the eco-friendly choices I was looking for. 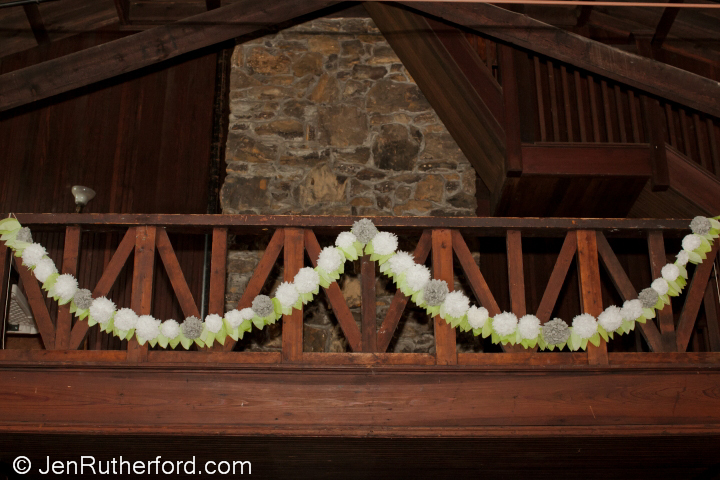 A wedding can create an enormous amount of waste which really bothered us. One of the big things I struggled with were the flowers. My favorite flowers are all spring flowers so if I wanted them in October I would have to ship them from Europe. Yes my flowers would have been more well traveled than I am! For a bit, I considered making fresh flower bouquets myself from local flowers but that would have been too much stress the morning of. And then there was the cost of a lot flowers that will last a day. Don’t get me wrong, I love flowers. I just couldn’t rationalize spending thousands of dollars on something that lasts a day. We decided to put that money toward wine instead. True, wine only lasts a short time too but it tastes better than flowers. These are also reusable and I still use them to dress up my craft fair booth. 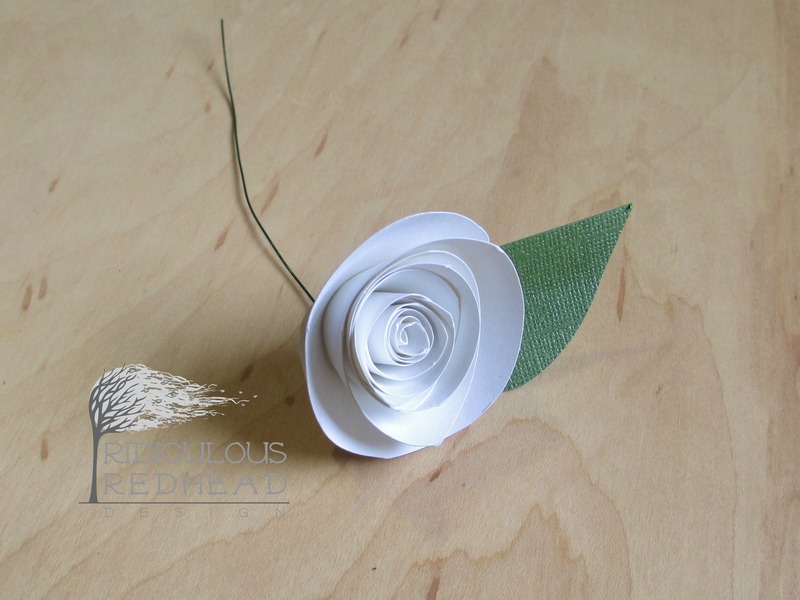 So I started Googling paper flowers. At first it was one of those projects that gets me the “ridiculous” name and I wasn’t really sure I could pull it off. 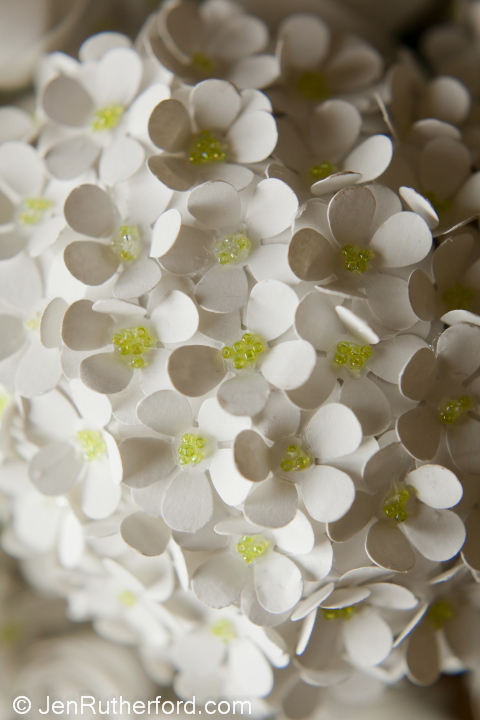 I started out by trying to make a bunch of different kinds of flowers. Some were beautiful but took A LOT of work and since I had to make so many, they were cut out. I narrowed it down to a few kinds that were simple enough and then just went to work. I started months before and would make a few here and there while watching TV. I didn’t really have a plan for the final look, I just kept making them until I had a lot. Then I started putting them together for bouquets and centerpieces. 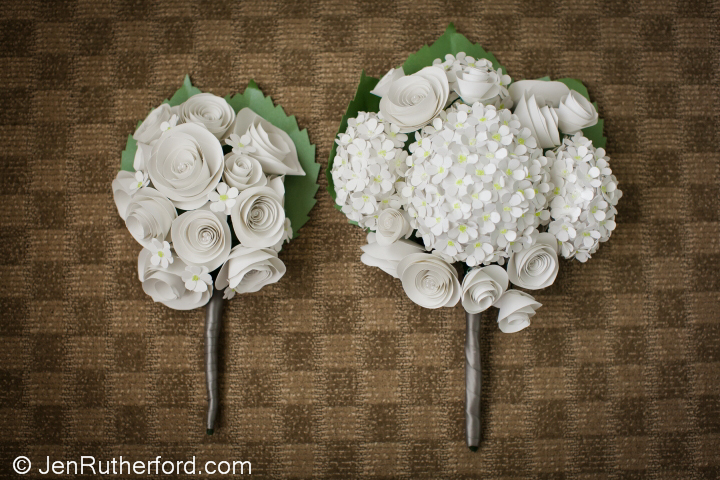 My bouquet is on the right, one of the bridesmaid’s bouquets is on the left. If you are interested in giving these a try look no further! Lets start with the rose swirly ones. 1. I used white (recycled!) card stock but you can go to the craft store and get whatever color you want. Cut out a circle out of card stock but don’t make it too perfect. Nature isn’t perfect and you shouldn’t be either. 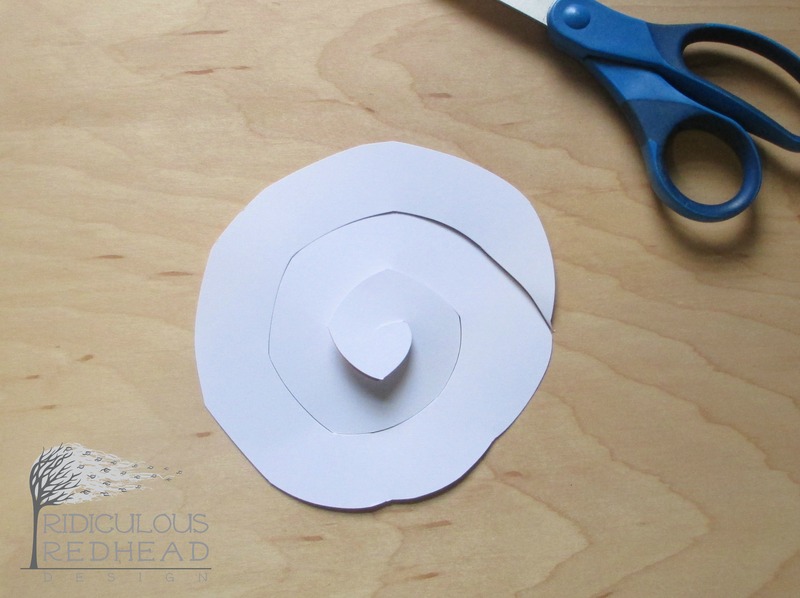 Then cut a swirl through to the center leaving a small circle in the middle. The thicker you cut the swirl the taller the flower, the thinner and it will be shorter and fatter. 2. Start with the outside and roll it up. 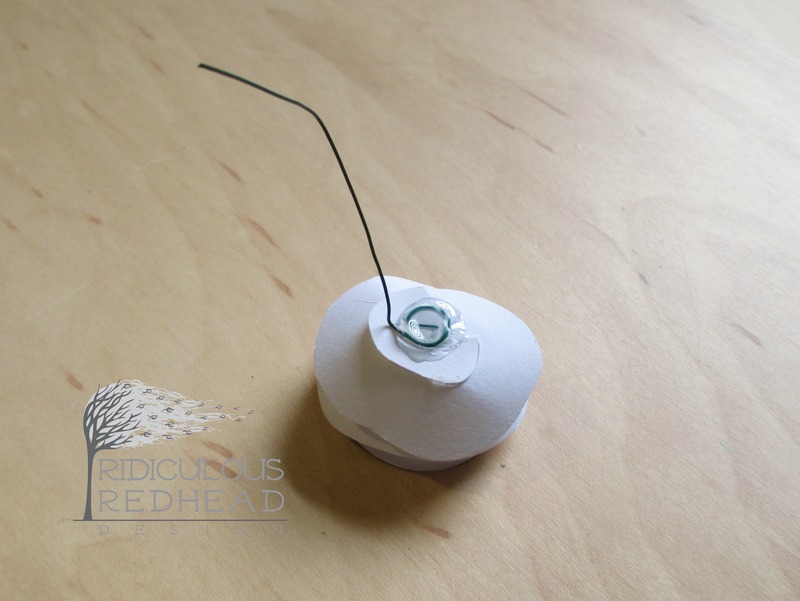 Put a big glob of hot glue on the small circle you left in the middle and make sure all the layers get stuck into it. I also hot glued some tiny pearls in the center of the ones in the bouquets to be a bit more fancy. Please excuse my messy glue gun. Somehow I melted the leg and it now has to lay on its side and things get stuck to it. It’s well loved. You can stop here and have a nice flower, and we used tons of these laying on tables as decorations. 3. If you want to add them to bouquets, they will need a stem. These are light so I just used a length of floral wire glued to the bottom. On some of the heavier flowers I had to double up the wire I glued on or use cloth covered heavy floral wire. 4. To cover that mess, I cut leaves out of green card stock then just glued them on. This is scrapbooking paper with some texture. The big leaves in my bouquets are the same paper. 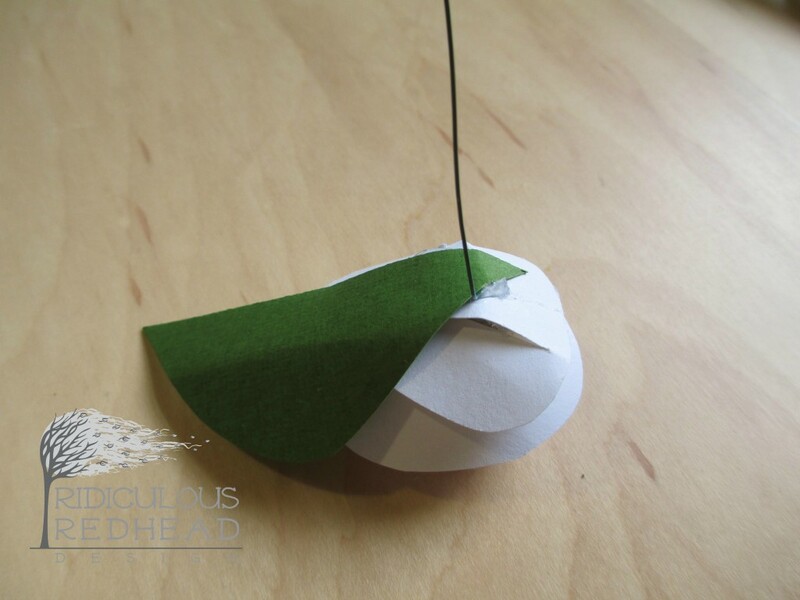 For those, I traced a hydrangea leaf from my garden, glued on some wire as a stem and used floral tape to bind all the flower stems together. To cover the floral tape and avoid having sticky hands on my wedding day, I wrapped all the “stems” with pretty ribbon. 5. And here is the finished flower. I left a bunch in this state and put them in vases or wrapped the wire around things to dress up vertical spaces. 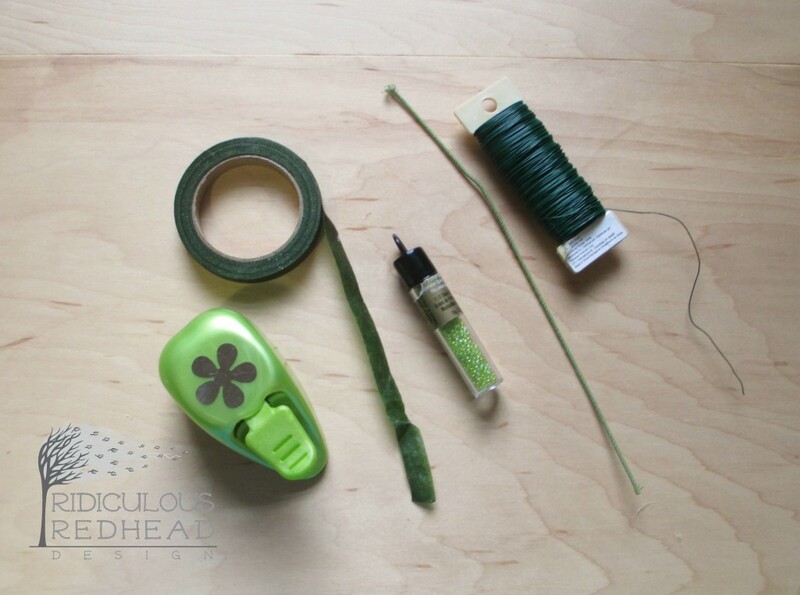 To take it one step farther, you can cover the wire with floral tape so they look more like stems in a bouquet. Here are some of the supplies I thought were handy: (from left) flower hole punch, floral tape, beads, cloth covered floral wire (great for the big flowers), and floral wire. I really wanted a bouquet of hydrangeas but once I realized how long they took I settled on only having a few with the easier roses filling everything out. 2. Next you will take the one million flowers and glue them onto some ball like shape. You can use a styrofoam ball but I didn’t have those on hand. I balled up some paper and then wrapped it in tissue paper which looked a bit more natural and not perfectly round. 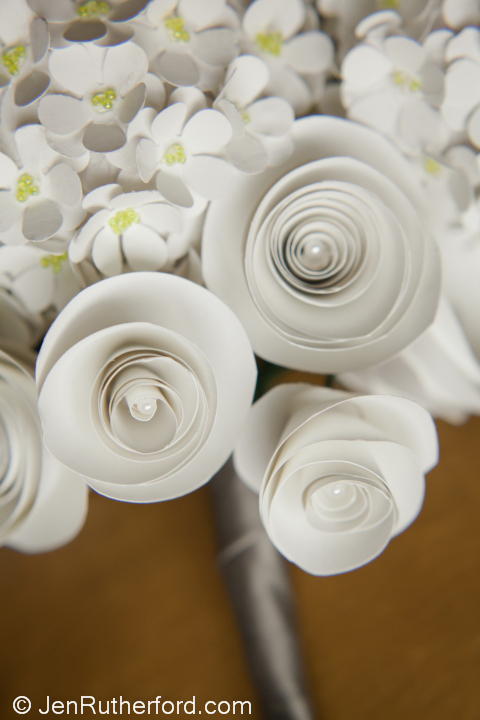 Keep in mind the tissue paper will show through the flowers . I kind of made that part up but I think I grabbed the ends up like Santa’s toy bag and tied it off with a rubber band gently. Or glued the hell out of it. Either way have something to tie the wire around to form the stem. 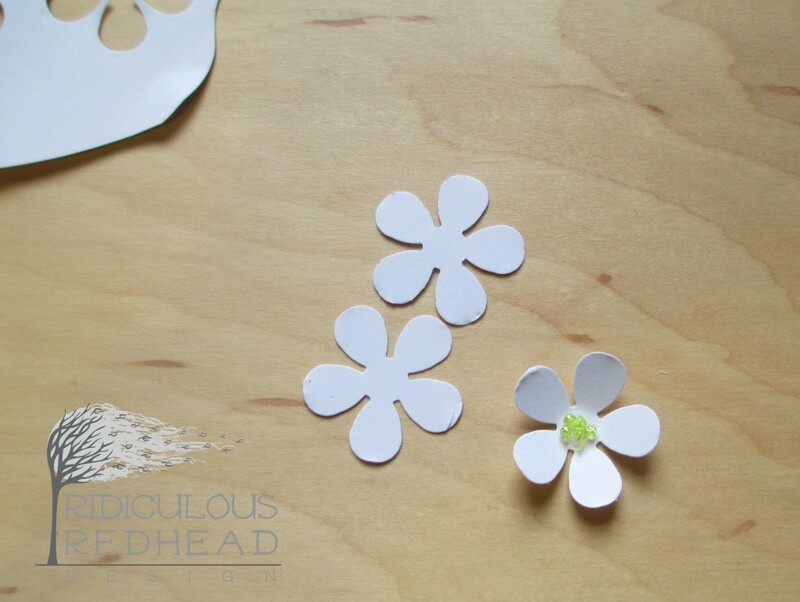 Try to glue the flower cut outs pretty close together so the petals have to stick up a little which will give it dimension. I also made some big tissue paper flowers that I used to decorate the balcony. Since this post is already getting pretty long I will leave you to google this one (they are everywhere). 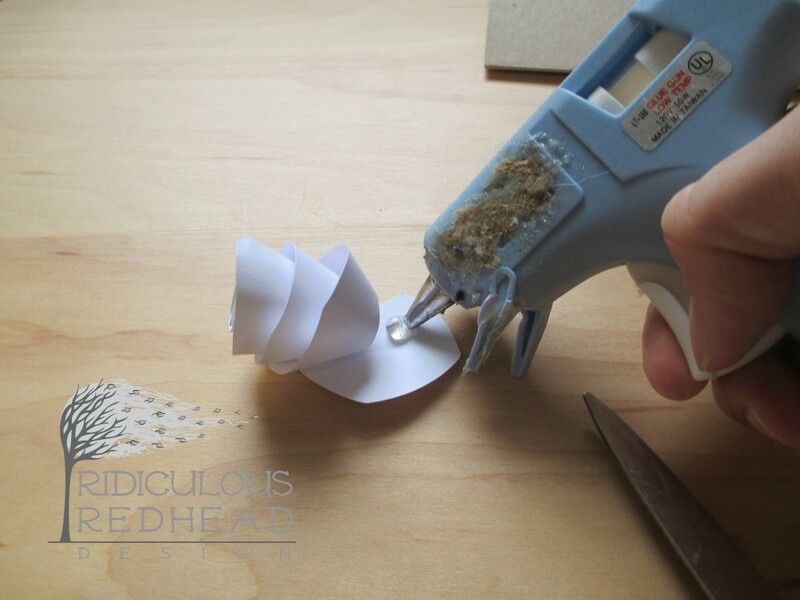 These are also pretty easy to do and if you make them large they can have quite an impact. 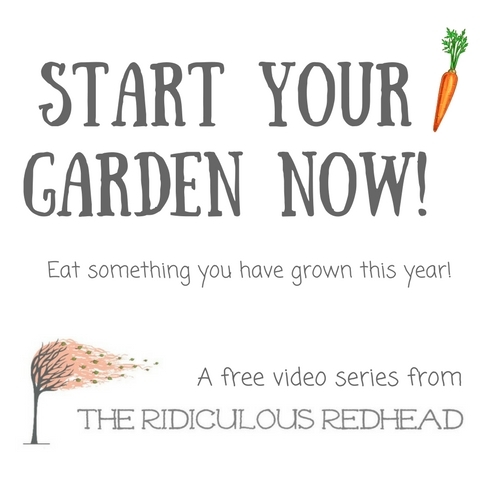 Ask me any questions you have in the comments below or email me at kelly@ridiculousredhead.com!